Fly is the most deadly diseases spreader insect and pest. They spreads more than 64 deadly diseases in human society. typhoid fever, dysentery, cholera, poliomyelitis, yaws, anthrax, tularemia, leprosy and tuberculosis are most common diseases spread by flies. Need pest control services or activities to control of fly is the most important in human life circle. Larvicides spraying in outer surrounding areas or the infested properties. Smell Less formulated pesticides spraying in inner premises of infested properties. Adulticides applications for inner and outer premises by mini or thermal fogger machine. Adructeen bait traps installation in the inner and outer areas of properties. Electrical Box-Light device installation of inner premises of infested properties. 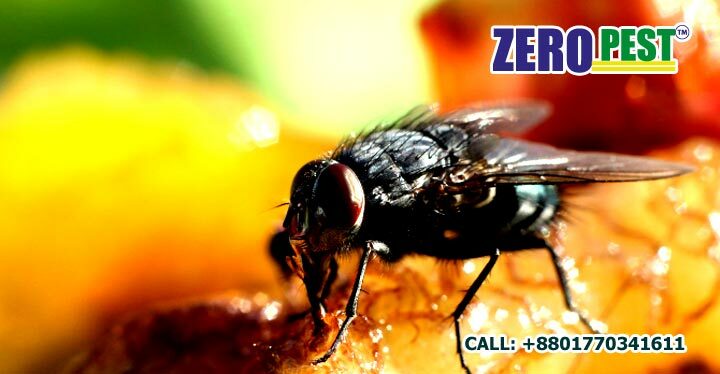 Zero Pest provides Fly Control Services in Gulshan, Banani, Baridhara, Basundhara, Dhanmondi, Uttara, Mirpur, Mhammadpur, Narayangonj, Chittagong, Gazipur, Maymansingh, Comilla, Sylhet, Habigonj and all over Bangladesh. We ensure most calculative price and best effort to resolve the issues of flies infestations. And finally our satisfaction depend on clint’s feedback.